I drove past the little mom-and-pop marina the other day. I kept my boat there for a dozen years until selling it a few years back. The old man who owned and single-handedly operated the place told me once how he had bought the property back in the late 1940s, built his house on the highest point of land, and had the creek at the end of the bayou enlarged and dredged so that he could put out a few docks. Over the years, the number of docks expanded with his little labor-of-love business. 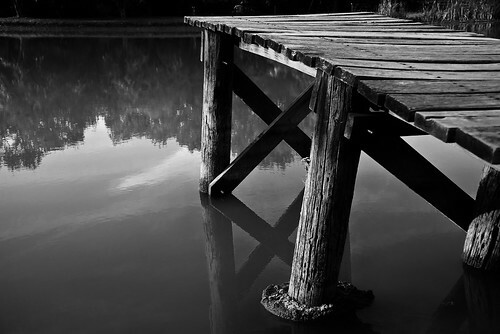 Yet not one dock ever amounted to more than two rows of long, narrow wood planks fastened to a series of twisted and unevenly cut posts extending twenty feet or so out into the bayou. The whole enterprise was a rather ramshackle sight and probably had been a non-conforming use in the township for many years. Yet somehow it seemed to belong; it was a familiar and endearing—even comforting—sight as one traveled across the bridge connecting opposite shores of the bayou. It is still very early in the spring and the docks stand all alone, unoccupied by the boats that will soon fill them. As I cross the bridge and look toward the house, I see the old man’s red pick-up truck parked in the usual place in the side yard. Vivid images enter my mind in rapid-fire fashion: the old man is sitting in the truck down near the gas pump; now he is hunched over his kitchen table in front of a window for all to see as they pass the house; then again he is out in the garden tending to his vegetables; or is that him way out back feeding trash to his burning-barrel? I see him driving his truck along the dirt two-track trail on the bluff above the docks and waving to me as I clean and wax my boat, readying it for the first launch of the season. I see him in the winter standing on the ice near one of his docks—he is now well into his 80s—hammering nails into the boards and pounding the posts through the silt and deep into the mud in preparation for the return of the boats in the spring. And I see him in the middle of the summer, sitting in an easy-chair aside the gas pump, waving to boaters coming and going, more than happy to assist them in filling their gas tanks while offering up a story or two about the good old days. When I sold my boat, I knew that it was the end of an era for me. No more evenings of rushing home from work, making a quick dinner, and heading down to the boat for a couple of hours out on the water. No more long Saturdays of running the boat out to Lake Michigan for a carefree afternoon in the wind and waves. No more hours of spring prep-work on my boat as it sits on the bluff above the docks. It sure seemed like the end of an era to me. Then last year the old man passed away. Now driving past the little corner of the world that he held down for so many years, it is somewhat disquieting to see that all of his things are still in their places, exactly where they should be: the pick-up truck, the docks, and the gas pump—even the table in the window. Everything is still there. Everything, that is, except for the old man. When I heard of his passing, I realized that the era didn’t end with me vacating my dock a few years back; the era ended with the old man leaving his docks behind, and heading out into that vast unknown sea that stretches to infinity and beckons us all. I enjoyed this post–incredible visual imagery.